Photo provided by Boj Capati. The Mount Hamiguitan Range Wildlife Sanctuary is a diverse mountain ecosystem with a high number of endemic plant and animal species. The area lies in the south of Mindanao Island. It is a representation of the Philippines biodiversity hotspot. 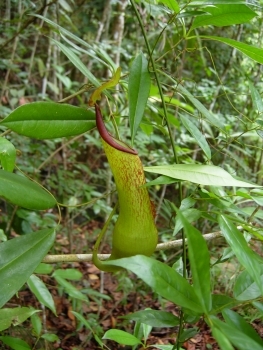 The mountain range is home to a number of globally threatened and endemic species, such as the critically endangered Philippine Eagle and the tropical pitcher plant Nepenthes hamiguitanensis. Mount Hamiguitan is a stratovolcano with an height of 1,620 metres. At its topmost it is covered by a unique 'pygmy' or 'bonsai' forest layer. Hamiguitan is a good 3½h by jeepney from the nearest town Davao. It is not an easy journey and you also need to ensure the driver drops you off at the junction to the visitor center and then still take a tricycle for the rest of the way. As accommodation is limited I recommend doing this really early morning and going back to Davao in the afternoon already. I can see why this is not of the more visited places as Mindanao is still considered somewhat unsafe in the southwest and tourism has almost nothing going on here. I also looked into renting a car but there is nothing. Once you finally make it to the visitor center you can pay a puny entrance fee for a pretty good museum. The core zones of the national park are offlimit to regular visitors. No permit - no hike. No guide - no hike. You can do some small hikes around the sanctuary to see something but the good stuff will stay hidden from us tourists. 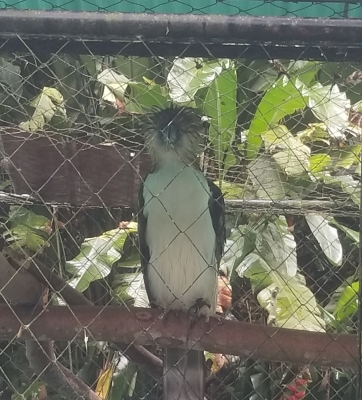 If you want to see the Philippine Eagle you need to go to the Eagle Center north of Davao which I used as a picture. I also wonder what happened to the proposal to add Mt. Apo into this inscription as this is another fine destination around Davao. In, 2010, Mt. Hamiguitan was closed to visitors in preparation for its bid to UNESCO World Heritage inscription. 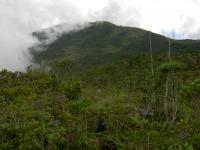 During a recent hike (July 2012), the protected area has shown positive signs of recovery. The mountain is indeed a biodiversity/endemism hotspot; its bonsai forest is just one of the many outstanding features of the property. Also worth noting is the tireless and collective efforts of the concerned local government units in ensuring the protection of the park. Such a practice is rare in the country and very inspiring. 4.5: Vicente B. Avanzado Jr. Reduced from broader TWHS: TWHS originally included Mount Apo.